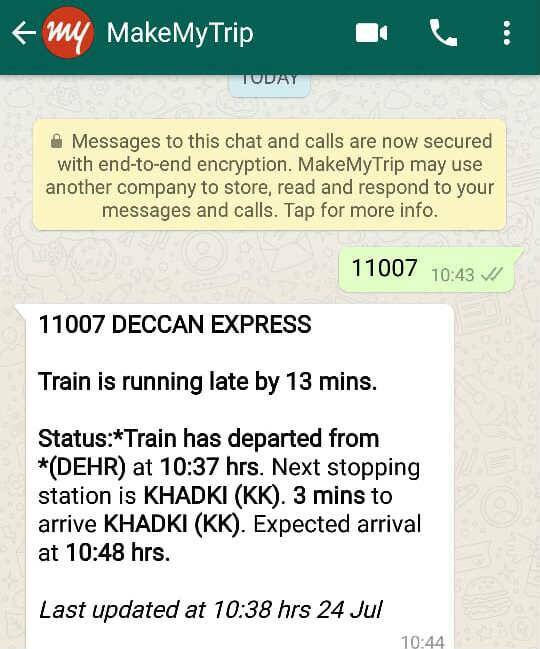 The Indian Railways aka IRCTC has partnered with MakeMyTrip to enhance its services by providing live running train status to passengers through WhatsApp. One of the most fast-paced and evolving departments under Indian government is the Indian Railways. The evolution from the British-era coal-fuelled railways to electric engines and ticket queues to quick all-time-open online booking options, Indian Railways aka IRCTC has come a long way to modernise with technology. In a bid to provide best services that are accessible to all, the Indian Railways has partnered with the private-sector holiday giant MakeMyTrip to provide live status updates of running trains through WhatsApp. Through this service, passengers can get updates for train timings, booking status, cancellation and platform number on which the train will arrive through WhatsApp. All you need to do to avail the service is to save MakeMyTrip’s dedicated number – 7349389104 and send the train number as WhatsApp message. Upon sending the train number and the blue double ticks appear, the details of the respective train will be sent to you as reply message. This might take about 10 seconds in most cases, unless the server is busy; in that case, it might take a bit longer. The service is automated through computer algorithms, which means, it will be available for use through day and night. However, it must be noted that the IRCTC’s new live running train status through WhatsApp feature can only be availed in the latest version of WhatsApp. So go to Play Store for Android or App Store for your iOS device and check if your WhatsApp has received an update and get your train details on WhatsApp.